BEIJING, Dec.13,Chinese Premier Li Keqiang on Thursday met with Ecuadorian President Lenin Moreno at the Great Hall of the People in Beijing, calling for closer cooperation under the Belt and Road Initiative. Since the establishment of diplomatic ties 38 years ago, China and Ecuador have achieved deep mutual political trust and fruitful results from cooperation, Li said. The Chinese side will join hands with Ecuador to elevate the comprehensive strategic partnership to a new level, Li told Moreno. Saying the Chinese and Ecuadorian economies are highly complementary to each other and enjoy huge potential for further cooperation, Li called for alignment of the China-proposed Belt and Road Initiative with Ecuador's development strategy. "We should make the best of the existing mechanisms, boost cooperation in key areas, push forward economic and trade exchanges based on market principles and international rules, advance a trade balance, and promote people-to-people exchanges," Li said. He expressed the hope that Ecuador can provide Chinese enterprises with a better environment to operate businesses, so as to achieve win-win results. Moreno said the two countries had respected and supported each other, and the Ecuadorian side is pleased to see China's tremendous achievements. He stressed that his country firmly supports the one-China principle and appreciates China's assistance in its domestic social and economic development. 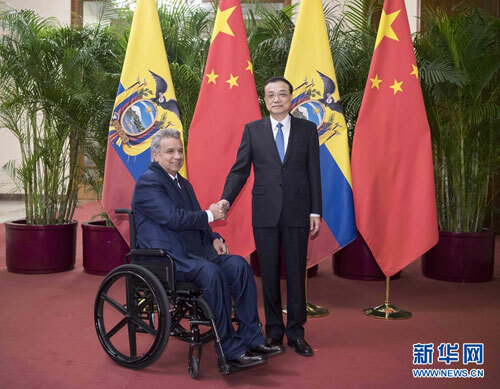 Ecuador is willing to participate in the BRI construction and intensify cooperation, said Moreno, adding that Chinese enterprises are welcome to invest in Ecuador with legal support and in a good business environment.